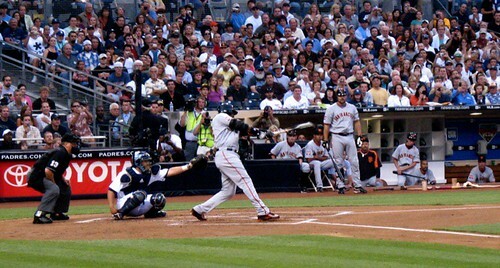 The photo above is of Barry Bonds hitting the 755th home run, the one that tied Hank Aaron for the career home run record. Notice in the upper left hand corner: There is a person taking a photo who is wearing an asterisk shirt. Yesterday, he hit number 756 to take the record and I couldn’t care less. 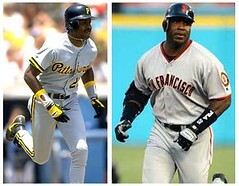 I have nothing against Barry Bonds personally. I don’t hate him or anything. I just think he’s a cheater. Yes, I know, I’m supposed to presume innocence but that’s in a court of law, not the court of public opinion. And except for San Francisco, I think the public has returned the verdict on the overwhelming circumstantial evidence that Bonds took steroids. I mean, c’mon! Some argue that every era has it’s cheating and this is just another part of that. But a corked bat or spit on the ball (or, if we’re talkin’ Twins baseball, here, an emery board) is a far cry from artificially improving your body, your power and reflexes, at the expense of your peers who are not taking steroids. I heard an interview with Patrick Arnold, the convicted designer of the steroid Bonds is accused of taking, The Clear. The steroid is named that because it was specifically designed to be undetectable by steroid tests. Arnold was interviewed on Costas Now and he ridiculed Bonds’ claim that he didn’t know what he was taking. He also said that the steroid does improve reflexes and has the effect of putting athletes "in the zone." There’s a world of difference between the manipulation of the physical objects within the game and the manipulation of the athlete’s body itself. I think ANYONE caught using steroids should be banned from the game and their records erased. It is completely unfair to Henry Aaron, Willie Mays (though he’s not complaining), Harmon Killebrew, and the rest of the top non-steroid era sluggers on the career home runs list. I’d kick out not just Bonds, but Sammy Sosa and Mark McGuire as well. I’m absolutely fine with that. I’m biased also biased against Barry Bonds, I should disclose. And the reason I’m biased is Hank Aaron. Let me tell you why. On April 8, 1974, the day that Hammerin’ Hank Aaron broke Babe Ruth‘s career home run mark, I was a ten year old kid living in the suburb of New Brighton, Minnesota. My best friend at that time was a black kid named Arthur. Art’s family was the only black family I knew of in New Brighton. There were some white neighbors the next block down who had adopted a couple of black children, but Art’s was the only black family probably in New Brighton at the time. The only time I’d see African Americans back then was if we drove into Minneapolis or occasionally there would be a black kid on a little league team against whom we’d play. Mine was nearly an all white world. As a ten year old kid, I did not think of race at all. Art was my buddy and that was that. The only time I was forced to think about race was when some kid made a racist slur against Art and it did happen sometimes. It was a dangerous thing to do, I thought, because I was pretty sure Art could have absolutely kick those kids asses. I knew. I played football against him all the time so I knew how punishing he could be just playing a game. All knees and elbows, Art was. But we’d talk trash back and that was the end of it. "You gotta watch this," he said. And so we watched Hank Aaron’s at-bat. We watched as Aaron took his majestic swing that sent Al Downing‘s ball deep, deep, deep as Dodgers outfielder Bill Buckner scaled the wall, hoping to pull it in, only to watch it drop in the Braves bullpen where reliever Tom House caught it. We watched as the crowd erupted and Aaron rounded the bases and a couple of college students left their seats to trot alongside him. We watched as the crowd around Aaron grew as he approached home plate where his mother awaited him. And I watched as Art’s dad pumped his fists in the air and scream and dance with delight. 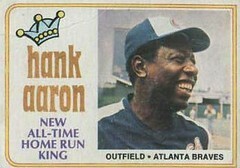 I thought, damn, he must really like Hank Aaron! I knew that Aaron had just broken Babe Ruth’s record and I thought it was cool and all, but I was absolutely oblivious about the significance of the home run as a racial equality event. I didn’t comprehend the extent of what Aaron’s accomplishment meant to Art’s father. Not until later, of course. I found myself thinking of the experience often when my family moved to Indiana during high school and I saw routine, undisguised, in-your-face racism. I was fortunate enough that my parents raised me to treat everyone as I would like to be treated myself. They didn’t say anything about race, they just said to treat people decently. Because of that upbringing, I was baffled with racism. I couldn’t comprehend how anyone could hate–hate–someone they had never met and had done nothing to deserve a drop of vitriol. But my experience in Indiana taught me that racism was inherited, that the racist kids that I knew had racist parents. So I will forever be thankful for having the good fortune to be in Art’s home at that time. The experience prepared me for later life in so many ways. I was able to understand a lot about people as a result. So, yeah, I’d rather have the person who breaks Aaron’s record earn it. While Hank Aaron will always be my home run king, I can always hope that Alex Rodriguez stays healthy enough to surpass Bonds.